The clock is ticking towards the long-awaited theatrical premiere for Star Wars: The Force Awakens and the last wave of marketing has officially commenced. In the past couple of weeks, there have been new trailers, character posters, and the first TV spot to generate more excitement for J.J. Abrams' film. With Star Wars 7 already breaking ticket sale records, you can make the case Lucasfilm doesn't need to do anything else, but they're continuing to unveil fresh promotional items. The latest materials are character banners showcasing The Force Awakens' three young leads: Finn (John Boyega), Rey (Daisy Ridley), and Kylo Ren (Adam Driver). These are obviously not the most revealing items to come out of the Star Wars marketing machine recently. All three characters are striking familiar poses with their weapon of choice in hand. Many fans have been wondering if there's more than meets the eye in regards to Rey's staff (which has been heavily featured), but we're going to have to wait until December to see how that bit of speculation pans out. One element about Star Wars 7 that does not require much speculation is its box office prowess. As stated above, the film has already shattered records due to advanced ticket sales, and there's a decent chance it becomes the highest-grossing movie ever made by the time its run has concluded. Since everyone knows The Force Awakens will be a massive hit, the only question left to answer is how substantial those dollar figures will be when it's all said and done. 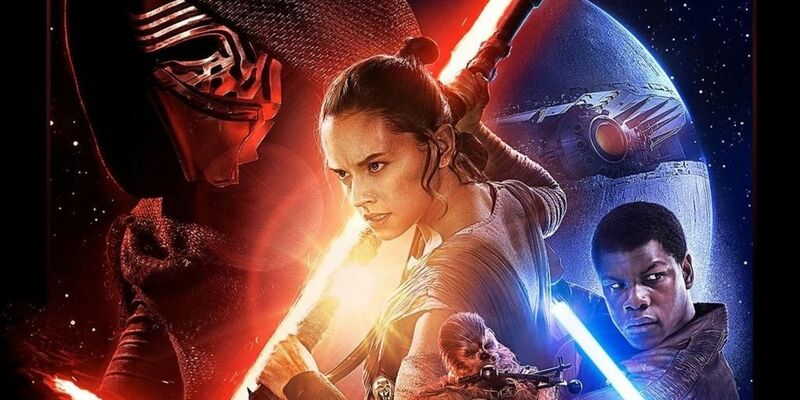 Collider has heard from one of their sources that The Force Awakens is currently tracking to bring in $225 million in the U.S. during its first three days alone. That would eclipse Jurassic World's opening weekend record of $208 million from this June. No December release (which includes Lord of the Rings, The Hobbit, and Avatar) has grossed $100 million in its debut, so Star Wars would really have to break new ground to have a shot at the record. But there are a number of reasons why it could do just that. The Force Awakens will essentially be the only blockbuster in town this holiday season. It has a monopoly on IMAX screens for a month, and the sheer amount of anticipation will ensure that it will have the most showings in standard theaters. With the minimal "competition" it will be facing, Star Wars can theoretically play non-stop from Thursday midnight screenings through the end of Sunday. That's a luxury few films are afforded - and with legions of fans coming out in full force to see the saga continue, the numbers could be unprecedented. It will be interesting to see what happens when December rolls around. Star Wars 7 is opening a week before Christmas, meaning some moviegoers could be too busy with holiday planning to make the trip to the theater. Also, inclement weather in certain parts of the country could prevent people from going. There's no denying that The Force Awakens is going to make a lot of money, but $225 million could be a little out of its range.